New at McDonalds! Plus a Giveaway!! I’m sure McDonald’s is a guilty pleasure for a lot of people. I personally enjoy them once in a while (perhaps more than once~!) and I honestly have no ill-will towards them. After all, you KNOW what you are putting into your body when you go there. And as long as you indulge within reason and logic, I really see no harm in visiting McD’s! They’re recently released quite a few menu items that I really enjoyed. 2 of them are limited edition so you better get them quick if you want to try them. 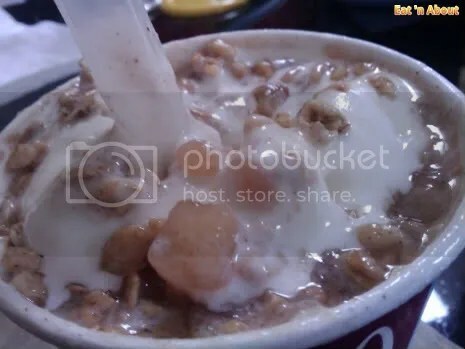 First of the limited edition items is the Apple Crisp McFlurry. Boy was this good. I really didn’t think I would enjoy it that much since I’m really not a big fan of apple and cinnamon. But this had ingredients such as granola and some crispy rice-bits along with bite-sized, real (albeit likely heavily processed) apple cinnamon chunks. The small is still quite big for me. I recommend freezing the uneaten portions for another time~! It may not be soft-serve anymore but still very very good. Also, I found that this really isn’t that readily available at McD locations so hopefully you will get a chance to try this out!! 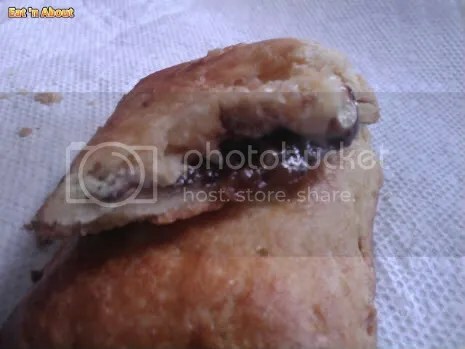 The next limited edition item is the Choco Banana Baked Pie. I’ve always really enjoyed the baked pie selections from McD’s. My favorite had always been the blueberry one from a few years back but I think I just might have a new one. And it’s this one guys. This pie is filled with banana cream and chocolate cream. I found it to be more heavy on the banana side. Also, this pie is best eaten HOT so the cream stays semi-fluid. Lastly, a new breakfast item!! 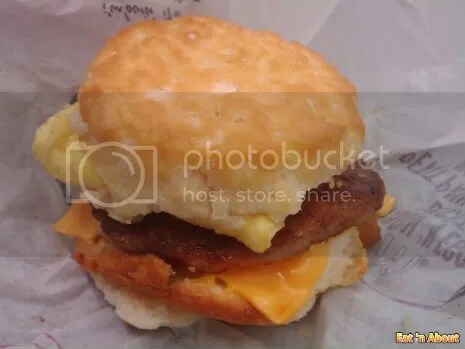 Assuming you haven’t been living under a rock lately, McD’s released the Buttermilk Biscuit as part of their breakfast menu. This is their first new breakfast item in 8 years (the last one being the McGriddle in 2003…I LOVE LOVE LOVE it). As a promotion, they offered it for free during breakfast hours (which by the way, had been extended to 11am now!) on Feb 9-10. And my friends, it tasted like it too. In a good way though. It was nice and crispy on the outside, and moist and fluffy inside. A bit crumbly though. But you can clearly tell that this can NOT be good for you in anyway haha. They’re apparently baked fresh every morning on site. I believe that since it tasted very fresh. But then my usual go-to location is actually the Corporate office of Canada for McDonald’s so I guess it HAD to taste good there. (By the way, I found that location brews the best coffee and makes the best coffee drinks also). I will also be giving away 2 “Be My Guest” certificates for the Buttermilk Biscuit. So to enter, leave a comment (be sure to include your email address in the appropriate field!!) regarding your favorite menu item at McD’s. Enter by Feb 24, 2011 (2 weeks from today) and I will hold a random draw the next day Feb 25, 2011. 1 ENTRY PER PERSON ONLY PLEASE and ONLY TO RESIDENTS OF CANADA!!! Good luck!!! I like chicken mcnuggets and the occasional apple pie. I always enjoy a Big Mac or a Quarter Pounder. Great fries, too! My favourite item is their mcnuggets. I found out about the free biscuit promo too late and wasn’t able to take advantage of the offer so I hope I win. I love the mcdonalds soft serve ice cream with their fries on the side! Yum yum! arrg! i missed out on the freebie fun because of classes. oh well… i still love their ice cream cones the most. i wish they still offered chocolate! btw did you know they brought back Hot Mustard dipping sauce for Mc Nuggets?? my favorite item from mcdonalds are the double cheese burgers. cheap and yummy! My favourite is a toss-up between the McNuggets, fries, and sundaes!! Thanks for doing the giveaway! Those buttermilk biscuits are soooooooooo good! Imagine all the food you could get with $50!! I love the McD’s apple pies and hash browns. They’re so bad, but sooo good. I enjoy the Quarter Pounder. Wow, it’s kind of hard to pick one favorite, but it has to be McD’s big breakfast!